Description: Wayfreight power waiting for assingment. Description: CP 1126 leads an intermodal train at a downtown railyard. 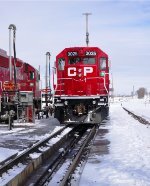 Description: This Canadian Pacific GP38-2, built 1983 by GMD, (s/n A4322), Class: DRS-20c, has been seen in its good old Dual Flags livery at CPR Hochelaga Yard, Montreal, Canada. Description: G-72 heads to the yard to start a day of switching out cars. Description: 36x6, 30 of the loads were stone/ballast from the quarry at Waterloo.